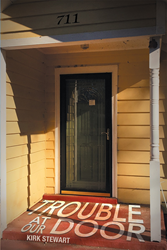 Kirk Stewart’s new book “Trouble at Our Door” is an emotional, telling work of fiction that takes the reader on a dramatic journey of passion, deceit, fear and fate. Recent release “Trouble at Our Door” from Page Publishing author Kirk Stewart is both thrilling and enlightening; this work depicts the dramatic twists and turns of an ordinary middle-aged couple’s life as it suddenly changes. Kirk Stewart, a Christian, teacher, coach, and devoted writer and author, has completed his new book “Trouble at Our Door”: a passionately crafted work that details one couple’s emotional journey as they defend and fight their way through troubled times. Published by New York City-based Page Publishing, Kirk Stewart’s suspenseful tale will keep the reader on the edge of their seat! This book is based on actual events. It is the story of how the lives of an average middle-aged couple were completely disrupted by extraordinary events. It is the story of how normal people living relatively obscure lives found themselves swept up in extraordinary events that seemed to be completely out of control. It is an emotionally charged story of the lives of people affected by trouble that came unexpectedly to their door. It will take readers along on the emotional journey that real people lived and endured. The importance of this story is not just that normal people had their lives changed forever (although they did). The real importance of this story is that if these horrendous events could happen to such normal, nondescript people as these people, then they could surely happen to anyone. This is the first book in a three-part series. The next book will be called “Living Suspended Lives”. Readers who wish to experience this profound work can purchase “Trouble at Our Door” at bookstores everywhere or online at the Apple iTunes store, Amazon, Google Play or Barnes and Noble.